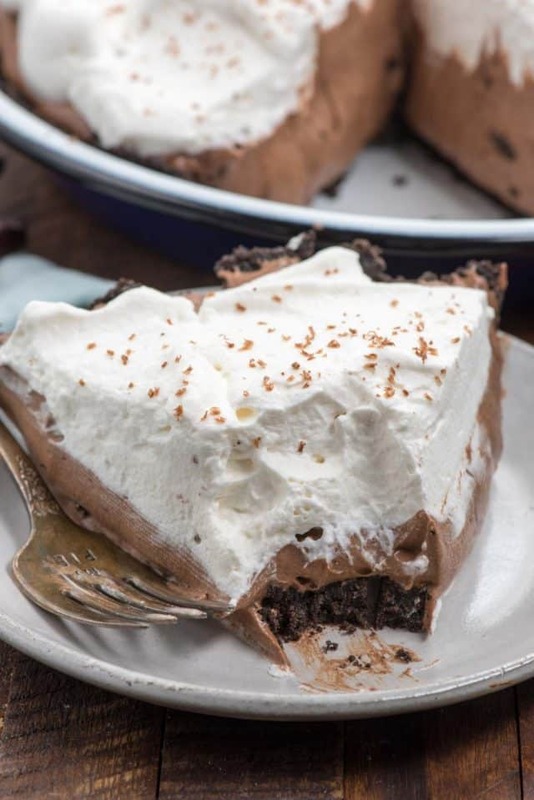 Easy Chocolate Fudge Pie has just a few ingredients and tastes like melted fudge! This is the perfect chocolate pie recipe. Seriously, it is. It tastes like a melted brownie! Can you believe that, as of today, I’ve been blogging for 8 years? Today, September 20th, is my blogiversary! Then, tomorrow, the 21st, is my 41st birthday. That calls for a celebration…with PIE! My birthday seems so anticlimactic this year. After all, last year I threw myself a huge 40th birthday party full of sprinkles and rainbows. I’m pretty sure any birthday would pale in comparison after that! This year my blog and I are spending our birthdays in Provo, Utah at CVX Live, a YouTube conference. Originally I bought the tickets for Jordan so she could meet her favorite YouTubers but then I realized that a conference about YouTube is probably pretty important for a creator like me to actually attend. And then another blogger asked if I’d be on a panel talking about food blogging so…I’m now speaking at this conference too! It’s going to be a blast and a fun way to spend my birthday…and a fun way to celebrate Crazy for Crust too. So…8 years of blogging. I still can’t believe where I am vs. where I started. The last year has probably been the hardest, mentally. The early years were the hardest physically (working all hours, doing all the things, learning all the things, building the business), but the last year has been hard for other reasons. For one, life has been more difficult. 2018 has been a rough year for us, and we’re looking forward to the end of it in a few months. I think when stuff gets hard in life, stuff gets harder at work, and that’s what’s happened with me and blogging this year. I’ve spent a lot of time staring at my computer, not knowing what to do, what to make, what to write, and having zero energy to do anything. Luckily, now that Mel is getting better and school is in session, I feel like I’m getting my mojo back a little bit. I’m excited for what the next few months are going to bring and I’m hoping that my 41st year can be what I’d hoped my 40th year would be. To celebrate our new year, we’re going to have PIE…obviously. 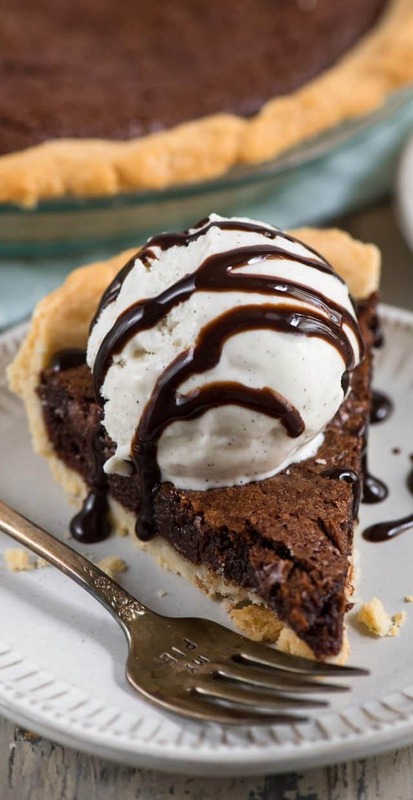 And not just any pie: CHOCOLATE FUDGE PIE. 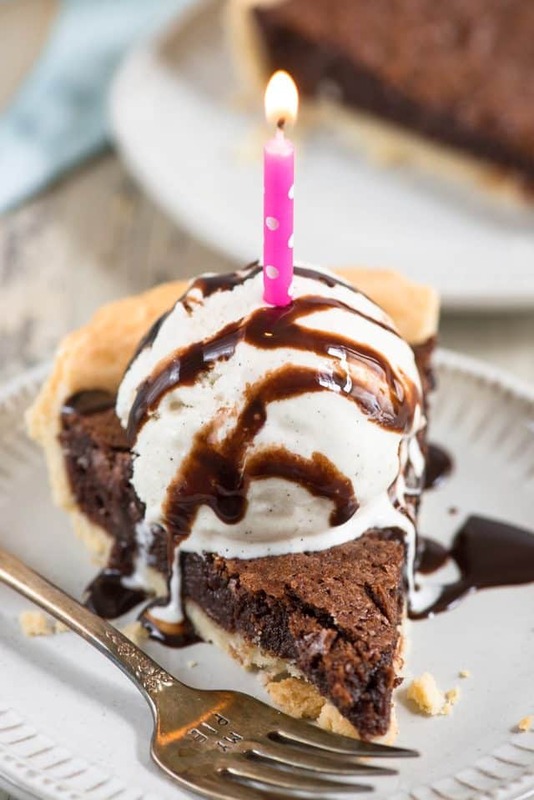 This gooey chocolate fudge pie tastes like a melted brownie! Now, I have a brownie pie on this site (actually, I have two). But this one tastes like the combination between brownie and fudge and chocolate chess pie. It’s a super simple recipe with just a few ingredients and it’s SO rich and delicious that all chocoholics are going to love it. Beware: this pie packs a punch. Serve it up with a nice glass of milk or a scoop of ice cream. You’re going to need it! I mean…what else would you expect from a fudge pie? So, what is a fudge pie? Basically, a fudge pie is a chocolate pie made with eggs and baked. It has a gooey chocolate center and a crusty chocolate top like a brownie. That’s it! It stirs up quickly and when you add it to a pastry crust (use my all butter pie crust or one from the store) it bakes up nice and sweet. 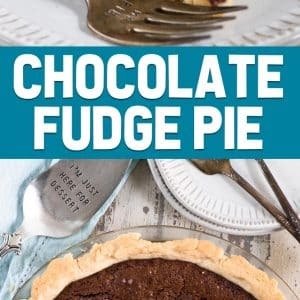 The rich chocolate fudge flavor is cut a bit by the pastry crust and it really does taste like fudge in every bite! Not only would this be amazing filled with candy, but I’d also love to add nuts to it next time. 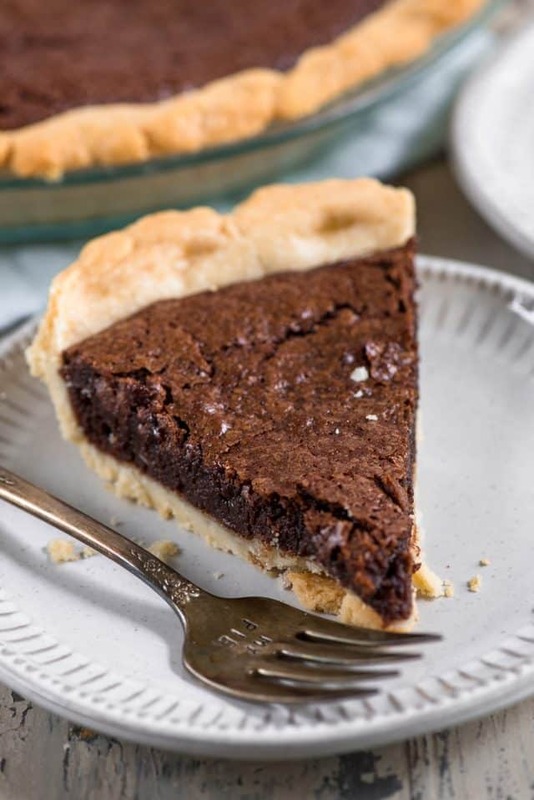 This is the perfect chocolate pie for any chocolate craving…especially if you’re a pie lover like me! 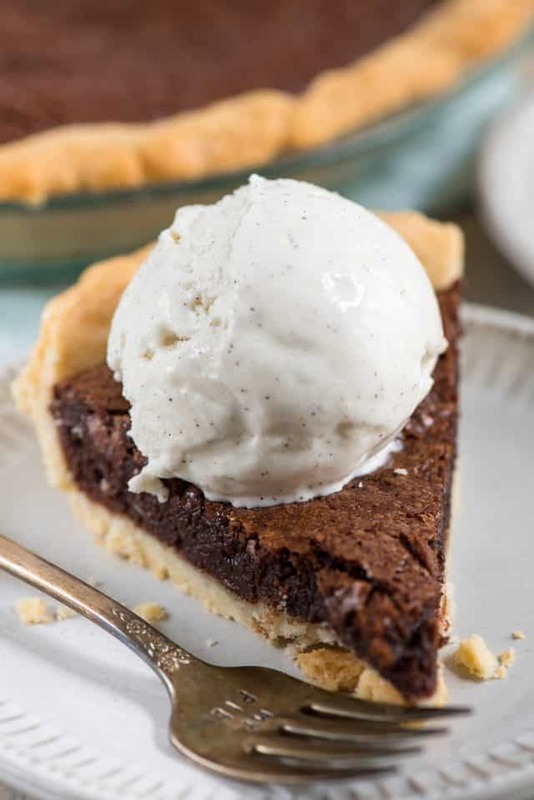 Chocolate Fudge Pie Recipe is perfect with ice cream! 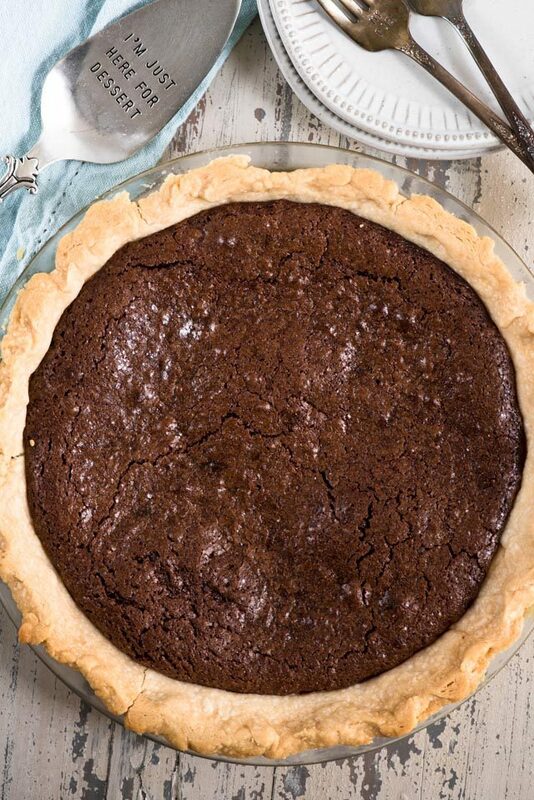 This easy chocolate pie recipe is so rich and fudgey like a melted brownie. Place chocolate and butter in a large microwave safe bowl. Heat on high power for 1 minute stirring after 30 seconds. Stir until melted and smooth, adding time as needed. Stir in sugar, eggs, salt, vanilla, and flour. Prepare pie crust and place in a 9-inch pie plate. Make sure the crust is cold! Pour filling into crust. Place pie on a cookie sheet and cover with a pie shield (or strips of foil). Bake for 30-40 minutes or until top is no longer glossy and starts to crack. Remove pie crust shield during last 10 minutes of baking. 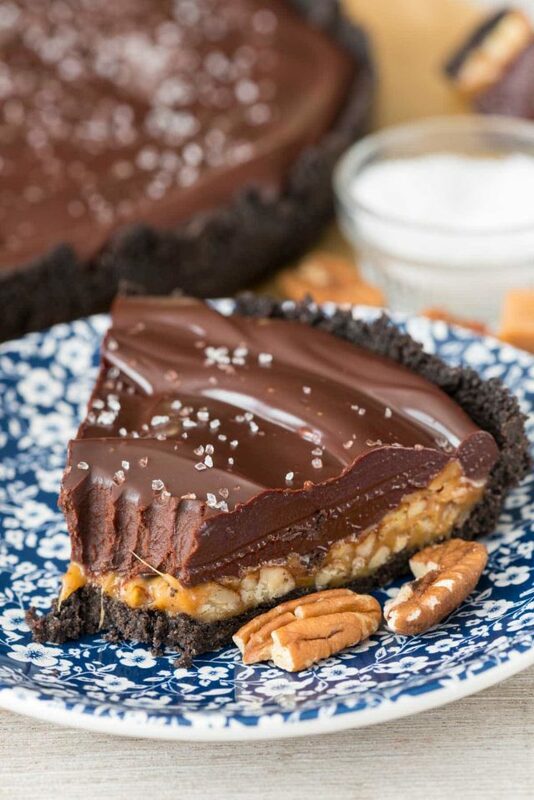 No Bake Peanut Butter Chocolate Cream Pie is the perfect pie flavor! 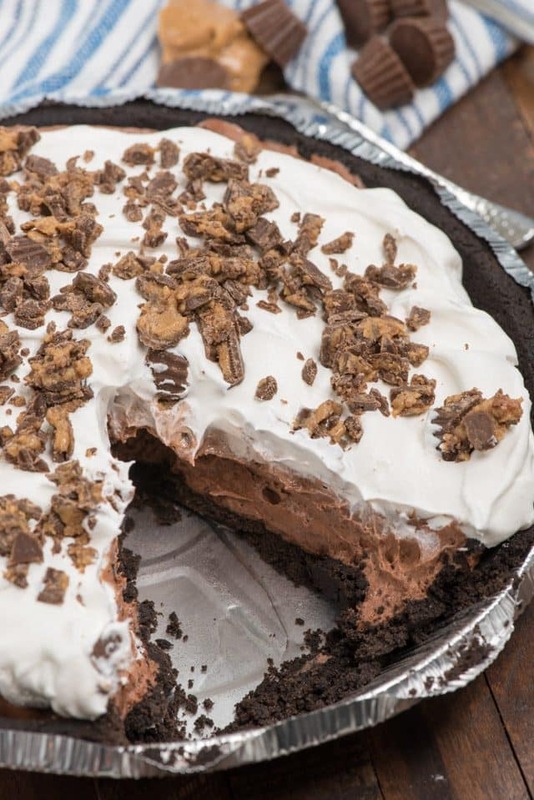 This really is the perfect Chocolate Cream Pie! This pie is a Salted Caramel Chocolate Ganache Pie! As you said no birthday or birthday celebration can really top your 40th last year. Definitely without a doubt a bday and a party and a weekend to remember!! Happy birthday, happy blogiversary, best of luck at the conference, and here’s to a great year for you!! Provo is my home town!!!! You need to try Waffle Love, cafe Rio (get the sweet pork) and Kneades (turkey ranch on froccia) just to name a few. That area really has some amazing places to eat. You also need to make a trip up to Sundance. Have fun! Wow, I didn’t realize that you were speaking. That’s great. Congrats and have a fun weekend. Happy blogiversary, happy birthday, and happy year! Oh, and great recipe too. OH MY GOD THIS PIE. Tastes like melted fudge…you had me at the first line. Only 2 oz of chocolate that’s it? That sounds like too small of an amount to give it a chocolate flavor? It tastes chocolatey? I want to make this so bad! I’m a total newb (newbie)! Should I bake the pie crust (store bought) and let it cool or do I just leave it unbaked and put the filling in and then bake? ?